Sandy, Utah (Nov. 1, 2016) – Sandy, Utah-based manufacturer of premium carbon wheels, Reynolds Cycling, has recently completed a phase of hires and restructuring of current staff. Mike Riley, Reynolds Cycling’s new marketing coordinator, joined the company on day one of Interbike 2016 after having enjoyed the past nine and a half years with BikeSource. Riley’s career at BikeSource began in Columbus, OH in sales while attending Ohio State University. In 2010, Riley was promoted marketing coordinator and moved to the company’s headquarters in Highlands Ranch, CO. In 2014 he became the marketing manager when all of the marketing was brought under one roof. “Joining the team at Reynolds has been a huge stepping stone in my career—I can already tell I am going to learn an immense amount about our industry while working here. The team is great and I couldn’t be more excited about my new role,” stated Riley. James R. Farmer, Ph.D., joined Reynolds Cycling in August 2016 as director of engineering. Given his extensive background in aerodynamics and computational fluid dynamics, he recently switched roles to assume the position of director of technology and aerodynamics. In his new role, James will focus his efforts on rim and wheel design using advanced CFD techniques and wind tunnel testing. James graduated from Princeton University in 1993 with a Ph.D. in mechanical and aerospace engineering, focusing on development of CFD-based design models for the aerospace industry. James is also a registered patent attorney and oversees all intellectual property matters and general legal affairs of Reynolds. “I can already tell Reynolds is a great fit for me—shortly after joining the team, a vacancy opened up that ultimately suits my background the best, designing rims and wheels with CFD and wind tunnel data—couldn’t be happier in my new role,” said Farmer. Karsten Bench joined Reynolds Cycling in 2015 within its sales department. As of recently, Karsten has been promoted to Reynolds Cycling’s product support and service/warranty specialist for the domestic market. Before joining Reynolds Cycling, Karsten worked in a number of bicycle shops in North Carolina as a mechanic and salesperson. . “I really enjoyed the sales environment here at Reynolds, but I had to opportunity to move to a more product-oriented job and I couldn’t more excited about my new position—the role suits me incredibly well,” cited Bench. Colin Blanchard joined Reynolds Cycling in August of 2016 as the company’s newest inside sales specialist. Blanchard will be assisting all outside sales representatives with order placement along with shop and customer-direct communications. Blanchard began working in bicycle shops at the age of 15 and has been working in the bicycle industry ever since. Blanchard began his career in the service department and worked his way up to service manager. In 2013, Colin became a wheel builder at Industry Nine Componentry. Collin went on to create the service and warranty department there and was promoted to the global director of service and warranty from 2015-2016. “Given the overlap of Industry Nine and Reynolds, this move has been pretty seamless for me. The new environment is great, and I now feel I have a great opportunity to grow professionally here at Reynolds,” said Blanchard. 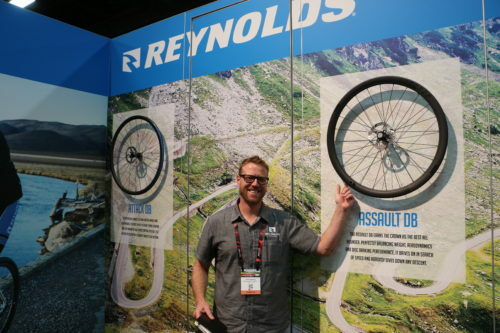 AJ Ariss has recently moved from an inside sales position, where he worked with IBDs and smaller OEs fulfilling orders while also managing several outside territories with sales support, to the role of Jr. product manager at Reynolds Cycling. Now working under head engineer Todd Tanner, Ariss will assist nearly every department in seeing new product through its life cycle, from concept, to development, and eventually to a completed product. Ariss held a management role at Cottonwood Cyclery in Utah for two years prior to joining Reynolds Cycling. “I could not be more excited to have the opportunity to grow with a company like Reynolds. We are at the forefront of technological advancement, and with the guidance of Todd Tanner, I’ll be able to learn the finite details that are necessary to develop and produce the nicest wheels available,” said Ariss. Lance Tolbert has recently accepted the role of global information systems manager. Tolbert’s prior role at Reynolds Cycling was information systems manager. Now as global manager, Tolbert will assist the drive and development of online access worldwide to Reynolds Cycling product. Tolbert is also now responsible for keeping the company’s worldwide network and security systems running to the best possible degree. Tolbert joined Reynolds Cycling following a ten-year career in networking and web programming at companies including Dynamic Media Group and Complete Network Solutions. “Moving to a global role here is a huge responsibility for me, one that I’m looking forward to. We have loyal customers around the globe, and I now have the means to make sure their access to our product is as easy and seamless as possible,” cited Tolbert. Susan Rich has been hired as the company’s Engineering Manager. Rich earned her BS in Mechanical Engineering from the University of Utah in 2007, followed by an MBA in 2016. Rich brings years of experience in composites engineering to Reynolds Cycling stemming from her decade-long position as a Composites Development and Tooling Engineer at Radius Engineering. In the position, Rich developed net-shaped composite designs for aerospace applications, designed closed-mold tooling for net-shape composite fabrication, supported aerospace clients in transitioning R&D programs to production setting, and managed design and construction of equipment specific to supporting composite part production. “I’m so excited to be applying my skillset within the cycling world—composite engineering in this industry is experiencing such a boom right now, I’m very eager to be a part of it and showcase what Reynolds has to offer,” stated Rich. One Response to "Utah’s Reynolds Cycling Adds New Employees"